Last Tuesday night, 17th April i had the honor to participate in a circle which will go into history as the beginning of regular Meshk Ilahi gathering here in Singapore. Its a Turkish form of Zikr (Dhikr) or Remembrance of the Divine. Meshk Ilahis comprise a genre of traditional Islamic hymns emanating from the Ottoman Empire dating back several hundreds of years. The word, Meshk means putting thoughts to work; is used to refer to elevating spiritual states through music, and by extension to practicing Ilahis whereas Ilahi meaning hymn, spiritual song. The lyrics are from shaykhs, sayyids, seekers and poets such as Mevlana Rumi, Yunus Emre and others. Each Ilahi is comprised in a particular makam, or Turkish musical scale; each transmitting a unique spiritual station or mood. 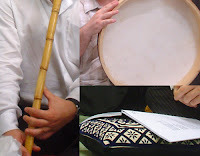 Rhythmic elements of the Ilahis are in two forms: bender (frame drum) and the chanting of Asma-al-Husna (the Most Beautiful Names of the Divine). During the standing zikr of the Jerrahiyya, the Asma itself the Remembrance proper, creating poly-rhythms as it weaves pulses with the drum beat. The melody of the Ilahis rides above the rhythms of the Asma and drum, altogether enveloping and infusing one’s open heart which has to do with the Alchemy of the Heart. Here the original Turkish hymns are translated and will be sung in English. The translations are provided by the late Shaykh Nur Al-Jerrahi (Prof. Lex Hixon PhD), who received transmission and authorization from Grand Shaykh Muzaffer Ozak al-Jerrahi al-Halveti (may their secrets be sanctified). Many of the Ilahis are from the time of Mevlana Rumi, some 800 years ago. Several Turkish Sufi Orders have been established worldwide, including in the United States, and one of these, the Nur Ashki Jerrahi Order has likewise recently been established here in Singapore, via the U.S. This gathering is facilitated by the Singapore based khalifa of the Nur Ashki Jerrahi Order of Sufis: Mustafa Abdul Wadud al-Jerrahi al-Halveti. The Zikr circle is open to all and will be meeting weekly from 1st of May, 2007 God willing. Read details here.